One of my readers (darn, can’t remember who now!) told me about SoftBums. When I looked into them, I was really intrigued, since I’ve never seen anything quite like them! The SoftBums system consists of a waterproof outer shell, and snap in inserts (pods). I received a chocolate color shell (adorable!) 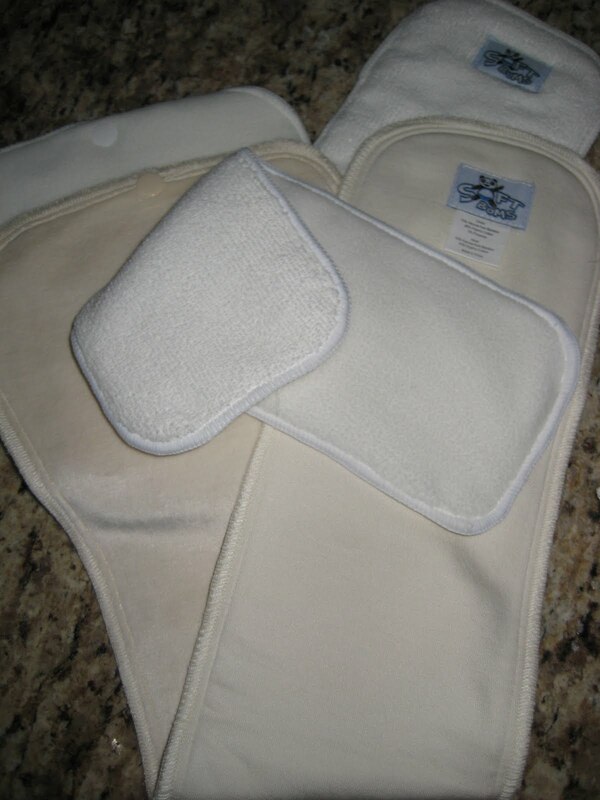 with a dry touch pod, an organic bamboo pod and a stay dry newborn insert/doubler (mini pod). That isn’t what makes it so unique though! 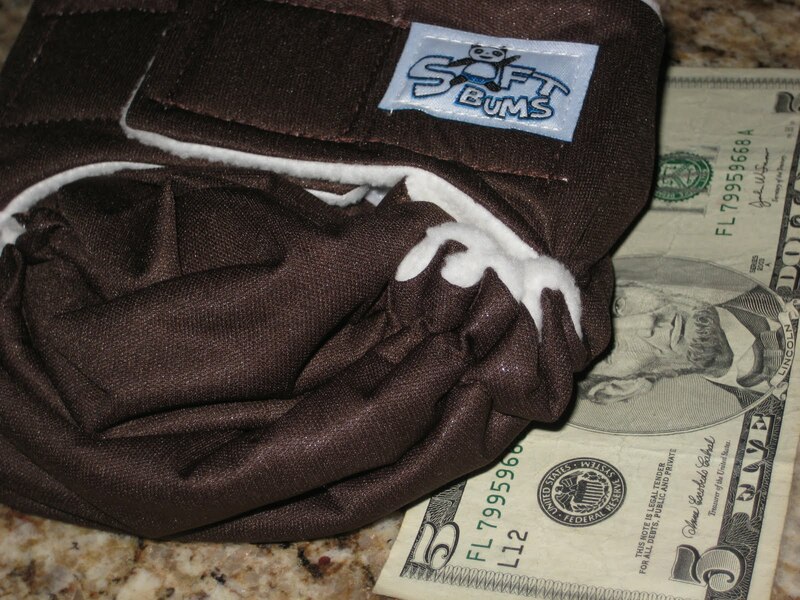 SoftBums doesn’t have a snap down rise or adjustable elastic with 3 or 4 sizes. It doesn’t have a fold down rise with 2 sizes. It has infinitely adjustable elastic with a drawstring system. I’ve joked about newborn “chicken legs” but this diaper comes pretty close to fitting an actual chicken’s legs. As in buck-buck-bagawwww chicken legs. It gets that tiny! The front of the shell has a small opening. 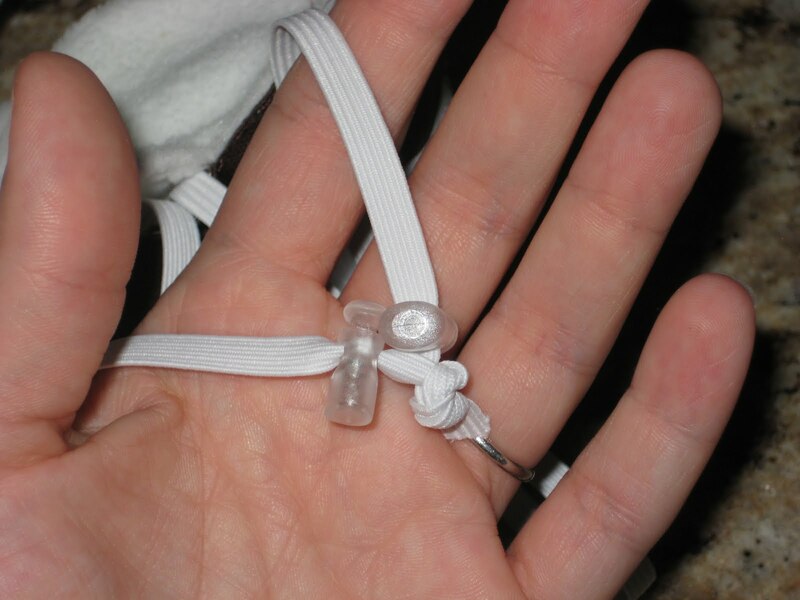 This is what the toggles to adjust the elastic look like. You do have to fish them out; I am positive there is zero risk of a child getting them out of the diaper, so no choking risk. At it’s tiniest, it gets tiny. 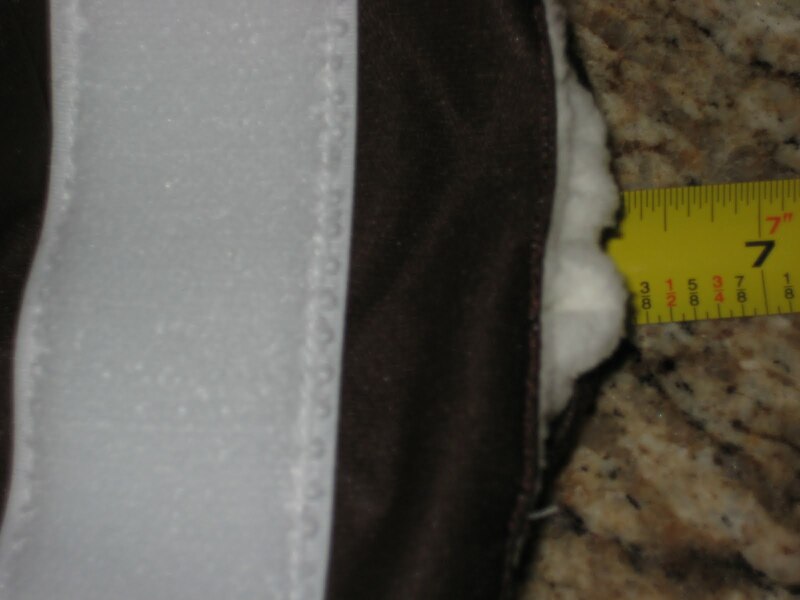 Above the diaper is folded, below it is stretched. With the elastic fully expanded, it gets fairly large. Here it is folded. I can’t really say “stretched” for this next pic because I had the elastic fully expanded, so there wasn’t any tension, if that makes sense! Initially, I was kind of overwhelmed about the completely customizable elastic sizing. I’m not used to more than 4 options! 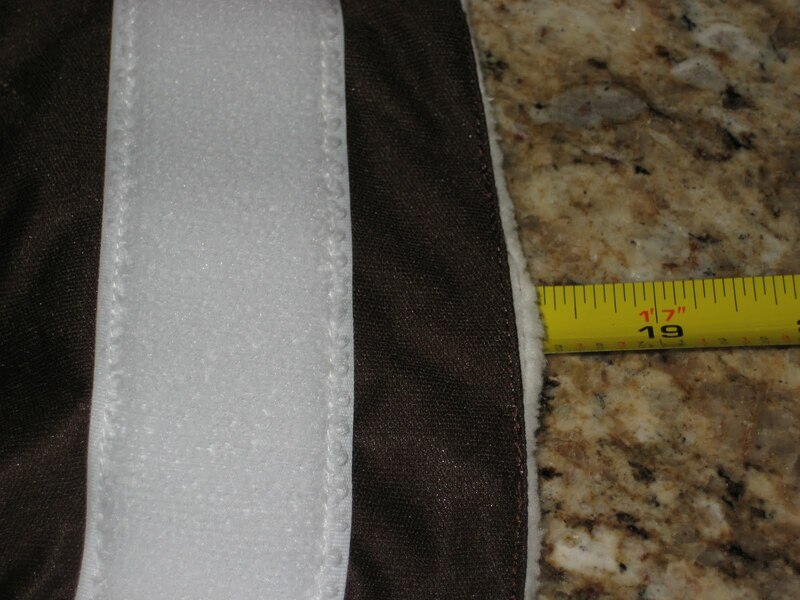 I decided to take one of my son’s size mediums, and try to get the diaper to a similar size, then tweak it from there. It took a little playing around to figure it out, but I think I got it pretty close! 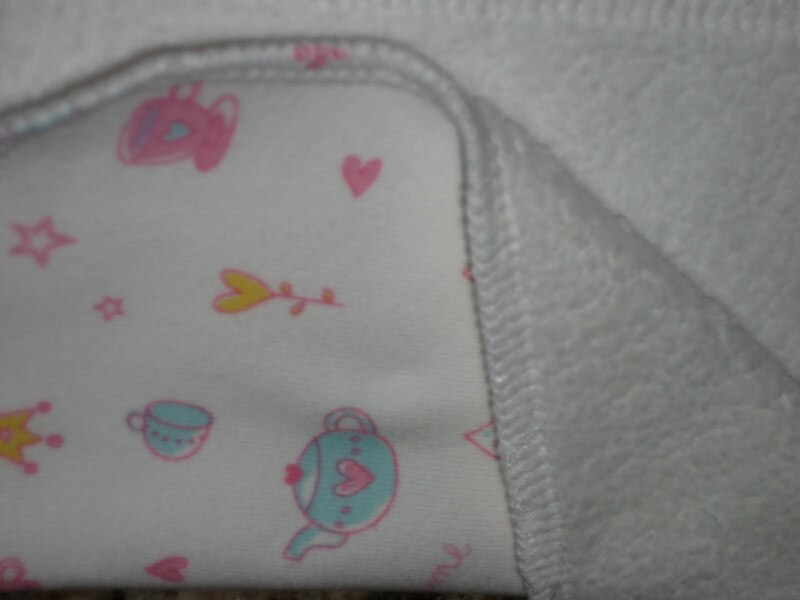 The inside of the diaper is lined with super soft material, so there’s no PUL touching baby’s skin. The inserts snap in. 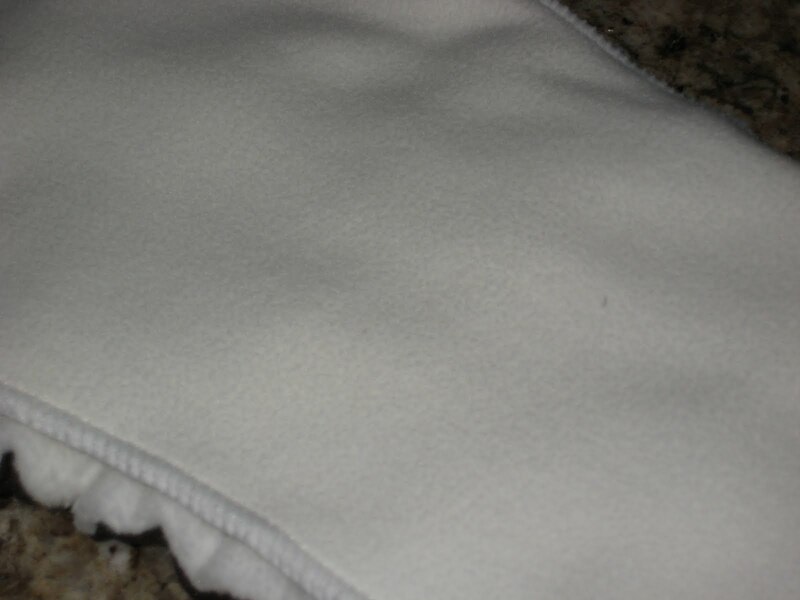 The inserts fit inside the diaper so perfectly, it really is an all-in-two; the cover can be re-used for several changes. 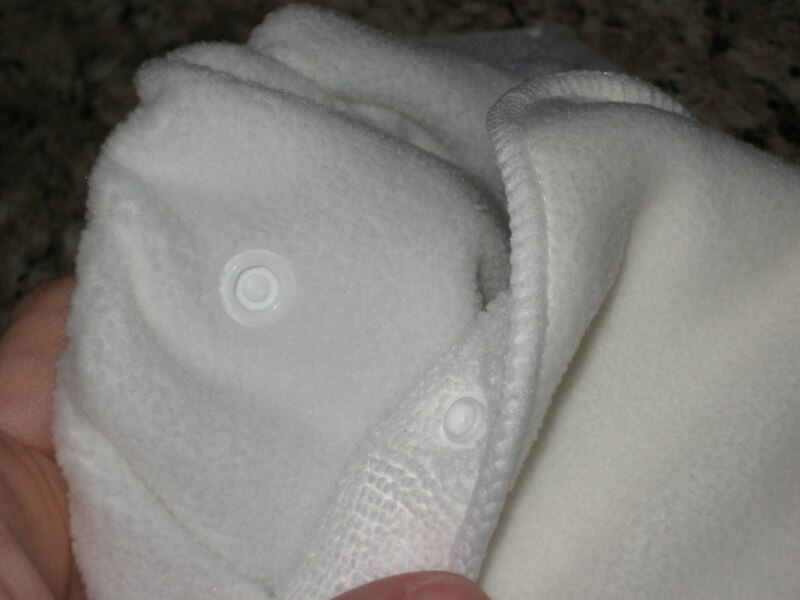 When you use the stay dry insert, you just have to be sure to fold it under, not toward the baby, so the soft microfleece is touching the skin, rather than the microfiber. I washed the diaper and inserts, and hung the shell to dry. I usually choose pocket diapers for their ease of use, but this was super easy. Maybe it’s the Velcro closures that make it so much simpler. 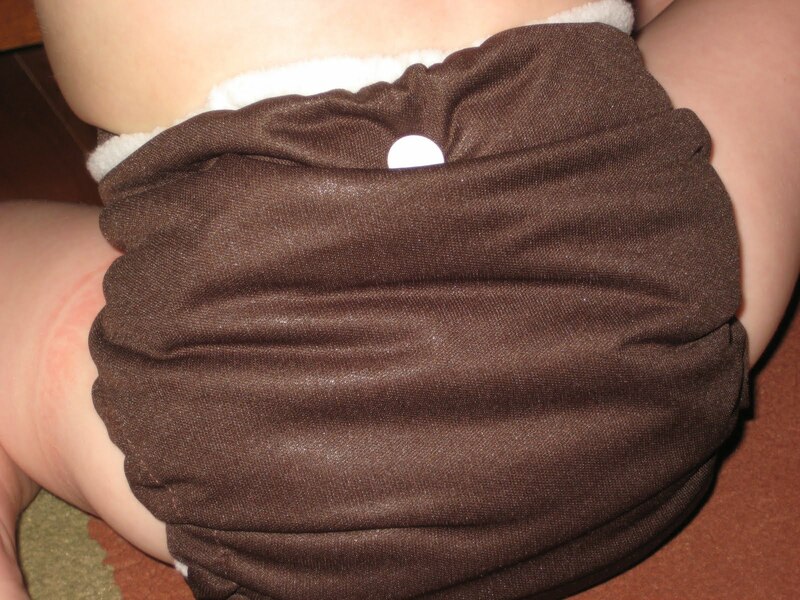 Other diapers I have with this type of insert have fold down rises and snap closures, so I’m folding, holding in place, folding a rise, then trying to snap 3 snaps on each wing, all while holding everything in place on a wiggly baby. I daresay the SoftBums system is Daddy friendly! I found the SoftBums to be very trim as well, different than other one size diapers and different than other diapers with similar soakers. We had no leaks and no wicking. In fact, this has served as both a nap time and car-ride diaper, and I’d continue to grab for it for either situation. Especially since it is so easy to take multiple “changes” on the road with a few soakers and maybe an extra shell. I wasn’t quite as fond of the organic bamboo insert. It was incredibly soft and absorbed very well. However, it was a bit larger than the stay dry insert, and didn’t fit quite as well in the diaper. edit: Sarah at SoftBums let me know that the organic bamboo insert will eventually shrink to the same size as the dry-touch insert. I’ve washed on hot and dried on high several times and haven’t noticed a difference just yet! It seemed rather bulky on, and I had to tuck the insert in a bit. My package also included this cute wipe. My daughter tried to claim it to use for her babies since it is girly, but it is so soft, and stacks perfectly on top of my Thirsties wipes, so I’ve been using it. I don’t think my son has noticed the teapots! When I have some funds, I definitely want to buy another SoftBums Echo shell and a few stay dry pods to use on the go. 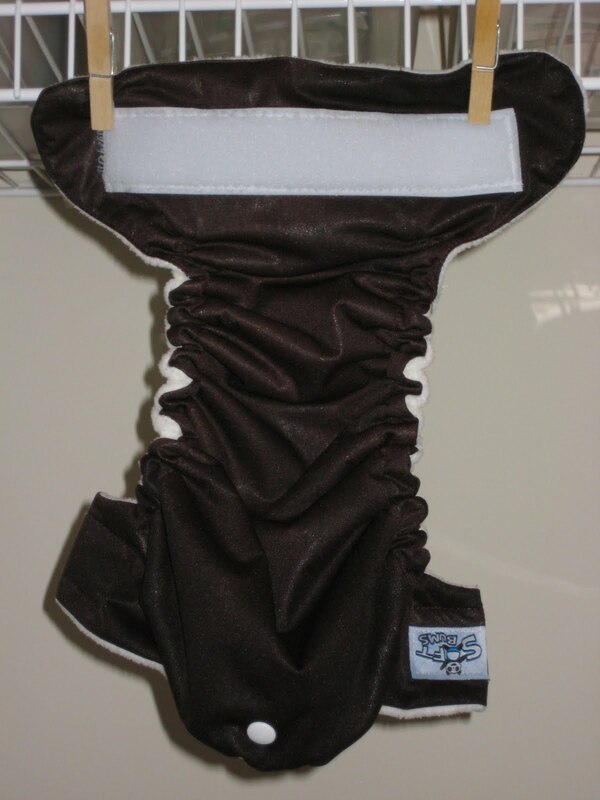 I also think adding a few of the mini pods would make a great and affordable newborn solution! A single shell retails for $21.95, DryTouch Pods $4.95, SUPER DryTouch (extra absorbent) Pods $5.95, Organic Pods $9.95 and Mini Pods $2.95. The shells come in 9 colors and three limited edition prints, and there are tons of packages available! See this diaper on my newborn. Want one? Find a retailer or win one! You may do any or all of the below. Please be sure to leave your email address in at least one comment if it isn’t in your profile. If you are using the “anonymous” option, please leave your email address in all comments. 1. Visit SoftBums and tell me what color shell is your favorite. 8. Share this blog or giveaway somehow. See the stack of “share the love” icons on the left of the page. You can use the StumbleUpon, Digg, Reddit, Facebook or Delicious icons if you have account there, you can post about this in your Facebook status (@Fitteds and Pockets and Snappis, oh my! and @SoftBums if you do that and please link to this blog post.) You can tell a friend via email, post on a cloth diapering board or group, “Favorite” my blog on Technorati or even vote for me on Top Mommy Blogs – Mom Blog Directory I’m not picky, just share with someone you think might be interested! This is going on the honor system, just leave me a comment telling me what you did to share. This giveaway is open to the U.S. only. I will accept entries until Friday, August 6th at 9 P.M. Eastern. I’ll choose a winner with random.org’s true random number generator and notify the winner by email. Winner will have 48 hours to claim the prize before it is forfeited and a new winner is chosen. Thank you to SoftBums for providing the review and giveaway products. As always, all opinions are my own, I didn’t receive any other compensation and I wasn’t requested or required to write a positive review! >I know this is an old post but I'm seriously considering buying soft bums for my first cloth diaper. I found your review very informative and easy to follow for newbies like me! I have a couple of questions. First, I thought the idea of the organic insert was that it was more trim is this not true? Second, I was all set to buy and then read a review (and an agreeing review) that the shell kept an ammonia smell – making the AI2 an AIO. Have you heard this at all? Third, were the red marks from this diaper? Sorry for the length! >I voted for you on TMB! >I liked SoftBums on FB. >I liked you on FB! >Ocean and Buttercup are my favorite colors. >This would be awesome to win! >i like softbums on facebook. >I like SoftBums on FB. >My favorite colors are nuclear pumpkin, chocolate, and coconut. Probably because these three colors are ones I don't have yet and are ones I want! >I want the sage color!! >the 'later gator' print is my favorite softbums. >I love the powderpuff color! >laura4him@bellsouth.netI told my friend about this giveaway! >I am a follower of this blog. >I adore the nuclear pumpkin color. Orange is *my* thing, and that name just can't be beat! >I already "like" you on Facebook. >Oh man, Happy Robots is awesome! >I like the chocolate and sprout colors. Too adorable. >I like the brown diaper and the one with Robots. >I think Ocean is my favorite! >I would totally get buttercup. I really like the concept. I've become a huge fan of gro-baby because of being able to use prefolds without them sliding, but this looks even simpler and more versatile! >FB fan of yours.ktiegen at yahoo dot com. >hahaha I think I would choose nuclear pumpkin just b/c of the name!!! >I follow Softbums on Twitter! >I like SoftBums on FB! >I like you on FB! >voted for you on top mommy blogs! >I like nuclear pumpkin. Partly because it's such a great name! >I tweeted about this giveaway yesterday but I didn't report it. Now I have. >I liked softbums on facebook! >I would love to try a chocolate colored diaper! >I like you on facebook, too. >I love the Powder Puff print, or bubblegum! >Chocolate is my favorite color! >already a fan on facebook! >I love Nuclear pumpkin and happy Robots! >Nuclear pumpkin, what an awesome and hilarious color! My fave for sure and I love, Love, LOVEyour blog! >I voted on Top Mommy Blogs. >I follow Soft Bums on Twitter. >I like Soft Bums on FB. >I visited the Softbums website and I love the Bubblegum pink color! >Voted for you on TMB. >I really like the lator gator print, but I like the nuclear pumpkin the best out of the solid colors. >Ii'm a new liker of SoftBums on FB! >I love the nuclear pumpkin!! >I'm "cousin Hailey" and would love to win a Bubblegum Softbums diaper pack. I could use a few more diapers, and I really like Softbums! >I "like" you on Facebook. >I like Softbums on Facebook! >I follow your blog via GFC! >I have the light blue shell, but the next on our list is the powder puff print, for sure! >oops, forgot to leave my email.. it's boatbumme at hotmail.comSorry! >I like softbuns on FB.